Sites We Like < The Best Easter Bunnies are Chocolate! The Best Easter Bunnies are Chocolate! What kind of Easter Bunny makes a great gift to give and receive? Chocolate bunnies! Sadly every year, baby bunnies and adult rabbits are purchased as Easter gifts, and then when the rabbits get older, the excitement of Easter wears off, and the reality of owning a pet that requires daily cleaning, feeding, exercise and socialization sets in… the poor bunnies are dropped off at animal shelters where few make it out alive. Or worse, let loose in a field, where they become hawk or coyote food. So thank goodness for Rescue Chocolate’s Make Mine Chocolate Bunnies! 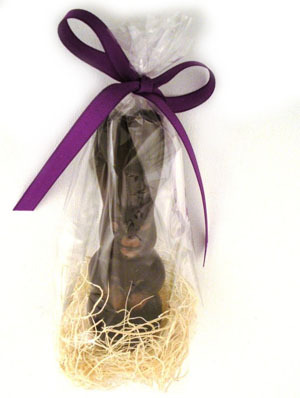 Yummy adorable chocolate bunnies wrapped up with a pretty ribbon, ready for delivery and devouring! Rescu Chocolate’s website says: “To break the cycle of purchase and abandonment, Rescue Chocolate has partnered with House Rabbit Society to promote “Make Mine Chocolate,” a campaign that encourages the purchase of chocolate bunnies for Easter rather than live rabbits. For more information about rabbits and how you can help, visit the House Rabbit Society website and the Make Mine Chocolate campaign. Ingredients: cacao beans, sugar, cacao butter, soy lecithin, vanilla.” Yum! You can click to buy yours online here.